April 1, 2013 - Lack of eye contact, staring at spinning objects or light, fleeting peripheral glances, side viewing, and difficulty attending visually are behaviors typically associated with autism. Yet these can also be signs that there is a visual component to your child’s challenges. 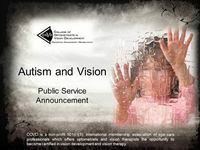 This April, the College of Optometrists in Vision Development (COVD) is participating in Autism Awareness Month and releasing a Public Service Announcement to help educate parents on the visual component to Autism. Most people don’t realize our eyes are actually part of the brain. So it stands to reason that if someone has a neurological disorder that impacts the brain, their vision would be compromised in some way. Children with ASD and other neurological disorders don’t complain verbally when their world doesn’t look right; they show us with their behavior. When vision disorders are treated, one can see improvement in the child’s behavior and how he interacts with the world. Here is one example of how a child’s behavior changed dramatically once the vision problem was treated. As a pediatrician, Zach’s mother was aware of the symptoms of autism. While he had many symptoms of autism, he did not meet enough criteria for that diagnosis. It wasn’t until she took him to a developmental optometrist that she understood how an undiagnosed vision problem could impact his quality of life. Dr. Janna Jennings shares, “Zach begged me to bring him a loaded gun so he could shoot himself in the head … Since he started wearing the bifocals prescribed by the developmental optometrist a little over two years ago, he has never said another suicidal thing again. After a few months of vision therapy, he stopped saying he was stupid.” While it took more than bifocals and vision therapy to help Zach fully recover, you can see the impact bifocals and vision therapy can make when there is a visual component to a child’s challenges. To learn more about how vision disorders can impact a child with ASD or to find a developmental optometrist near you, visit COVD’s website: www.covd.org. “For this April’s observance of Autism Awareness month,” Damari continues, “we invite everyone to take a few minutes to view our Public Service Announcements and share them with your friends and relatives.” The Autism and Vision PSA is airing on Insider Exclusive and can also be seen on COVD’s YouTube channel. The College of Optometrists in Vision Development (COVD) is an international, non-profit optometric membership organization that provides education, evaluation and board certification programs in behavioral and developmental vision care, vision therapy and visual rehabilitation. COVD has a series of public service announcements (PSAs) which help raise awareness that vision problems not only interfere with learning, but sports performance, and also other activities of daily living. The new PSAs also address vision problems that impact individuals who have autism spectrum disorders and those who have suffered a head injury. The organization is comprised of doctors of optometry, vision therapists and other vision specialists. For more information on learning-related vision problems, vision therapy and COVD, please visit www.covd.org or call 888.268.3770.